The Columns Gallery presents a special exhibition bring together photograph of Michael Wesely and glass design of L'anverre in one space from 1st December 2008 until 30th January 2009. 'Michael Wesely & L'anverre' will reveal the beauty of flowers and modern vase through Michael Wesely who is a known as a photographic artist from Germany and his works from a solo exhibition on a flower at Den Haag Gemeete Museum in Netherland in last May along with L'anverre is an art collective that well known as glass design, mostly perform in Europe and the glass works recent grand exhibition on various glass designs at Museum of Ansembourg in Belgium. 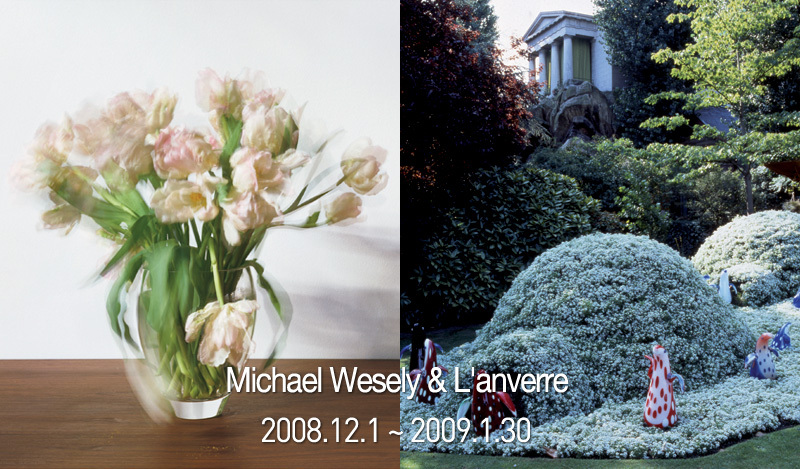 This Michael Wesely & L'anverre exhibition is composed with Michael Wesely's series of photographic on a flowers; 'Still Life' and L'anverre's glass design works. A series 'Still Life' is represent a classic subject a flower in a vase into more mystique and visionary image through shake techniques; longer shutter time in a limited light environment, capturing a full bloomed flowers become shed. L'anverre has international fame especially from Europe on glass design art, sculpture, photography and picture display. It exhibited in many European museums during last 20 years, including Chateau Musee d,Annecy in France and most recent exhibitions at Museum of Ansembourg in Belgium. Especially, L'anverre is receiving superb recognition as its creative glass works as it is not just simple glass industrial arts but more of glass sculptures. The Columns Gallery is presenting this exhibition to demonstrate that flowers and vase can be assorted well together by bring in the works from both; a fine art which is excelling into new line of visual art beyond simple photograph of Michael Wesely and a sculpture art which is excelling into Design Art beyond simple glass industrial arts of L'anverre. This exhibition will be a precious chance to experience the celebration, joy and inconvenience through splendid beauty of flowers and vase in this Christmas and New Year.